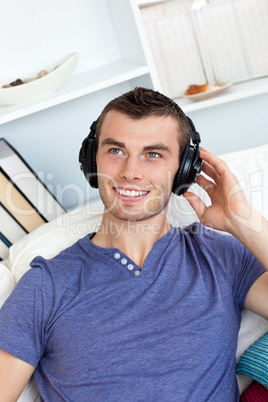 Royalty free photo Lively young man listening to music sitting on the couch with a maximum resolution of 3744 x 5616 pixels. The image Lively young man listening to music sitting on the couch is one of 23697 photos in the category Freizeit and has been part of ClipDealer's stock since 22 Aug 2010 22:18:25. Lively young man listening to music sitting on the couch is released for Kommerzielle und redaktionelle Nutzung.